Quite possibly the most verbose 13 list ever. However, I felt like divulging what to me are the highlights of my childhood. 1. I once kissed a hot kettle on the stove because I didn’t want to get my fingers burned (I wanted to see if it was hot, you see). I went around with toothpaste on my burned lips for a week. 2. My sister kissed the frozen ice in the freezer because she was feeling hot. Her lips promptly got stuck (runs in the family huh?). What followed was pandemonium as my parents and Lola tried to figure out how to break her lip lock with the freezer. My youngest sister came by and while everyone was distracted, suddenly pulled my sister from the freezer. After the screaming, we all looked (fascinated) at the chunk of flesh from her lip that was left in the ice. 3. My grand-aunt has lived with us since I was four months old. She’s still with us, together with her older sister (my grandmother), and they have a grand time teasing my kids. 4. There are currently four generations of women living in our house: my grandmother, my mom, me and my daughter Faith. One of these days, I will get around to taking a photograph. 5. (Whisper) I have a goofy dad. He used to wear a makeshift grass skirt (made out of coconut leaves) and dance the hula in the street in front of our house. Now he’s a goofy grandpa and the kids love it. 6. My sister once fell naked from the guava tree in our backyard (she wasn’t hurt) because she was hiding from our maid who wanted to give her a bath. 7. Remember the infamous brownouts that plagued Manila years ago? My sisters and I spent the hot and humid evenings up on our roof, looking up at the stars and daydreaming for hours about who we were going to marry. 8. We were at the top of a mountain where my grandfather grew dalandan trees; I started running to catch up and couldn’t stop because of the incline. I was going faster and faster, screaming for my dad and in desperation, I grabbed my sister as I sped by. She was picking her way slowly through the trees and she got dragged with me – we kept going until my legs gave and I stumbled on the wet grass. She ran smack into a dalandan tree. I laughed my head off while she was (understandably) furious at me. 9. My cousins and I loved to swim in the river whenever we visited our grandparents in the sleepy small town of Sta. Maria, Laguna. One time, after swimming for more than an hour in the river we noticed this huge mound of carabao poop floating in the water. 10. Favorite past times in the province – playing shatong (which I was never good at), catching dragonflies, racing up and down the baboy kural, and when we were older, endless games of pekwa and pusoy dos by the light of the gas lamp. 11. At the height of the manananggal scare in Manila, my sisters and I got hysterical when we saw a shadow move across the bay window of our room. We ran screaming from the room only to be blocked from opening it by my youngest sister who got squashed across the door in our rush to open it. So there we were, alternately calling for my dad (who couldn’t come in because the door was locked) and trying to shove each other out of the way until we could drag our sister from the door to open it. I think we all slept in my parents’ room that night. 13. If I don’t post anything after this one, it means my sisters have killed me. ** Friday night date *g* -- My Super Ex-Girlfriend is one funny movie! I can't remember the last time I laughed out loud in a movie theater. Recent comedies usually just get a chuckle or a giggle from me (unless it's Adam Sandler in which case, I scowl). This movie got a guffaw out of me -- even after we left the theater. ** Saturday morning drive to Tagaytay with me taking over about halfway (the part where there's no traffic, heh heh). Cold weather, chilling with the kids and my parents at the house, fabulous fried chicken and seafood pasta for dinner, I tell ya, what more can you ask for? 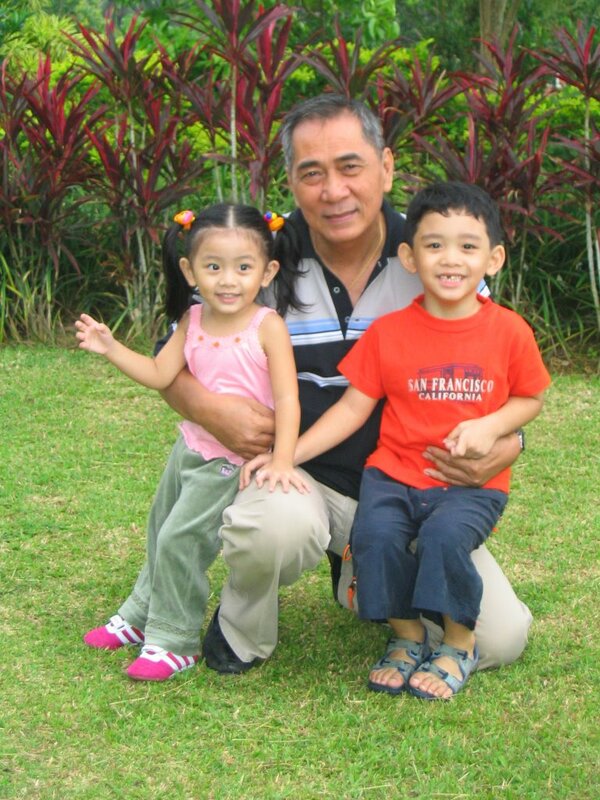 ** Kids with Grandpa. Need I say more? ** Kid's birthday party Sunday afternoon and Joshua needing no encouragement to join the games. You don't know how happy that makes me, since it means no more parties with Joshua glued to various parts of my anatomy he can attach himself to. Faith, being the trooper that she is, was just coolly casing the room, yaya following behind her, picking which balloons she wants. Josh: Ok, mommy. We'll give you a time out when we're home, right Daddy? Jun : Right! I'm gonna tie mommy up. Josh : Mommy I have to make poopoo! Me : Ok, go to the bathroom and tell Daddy. Josh : (peering into my face) Mommy, are you staying with us today? You're not going to the office? Me : No, I'm staying. Josh : (smiling) Thanks mommy. I like it when you stay home with us. Aww, man. Like I don't feel enough guilt already. Me : Monster bit me. Faith : Monster bite you? Faith : (crossing her arms and frowning) Monster bad! Faith angry! 1. My husband had no idea of how goofy I really am until we were married. 2. I can sing instrumental songs really well. And I don't mean humming. My renditions of the Star Wars and Indiana Jones theme used to keep Jun awake on the long drives from Las Pinas to Project 4 (I sing it to him on the phone). Joshua loves my version of the Superman theme song -- he puts his arm up in the air (like he's flying) and has a serious look on his face the whole time I sing the song. I swear I have to videotape it one day to show at his wedding. 3. The more outrageous I am, the more my husband adores me. 4. I have a really weird way of eating M&Ms with peanuts. I eat it in stages, first I eat the candy coating, then I eat the chocolate and then the peanut. This is also the way I eat Ferrero Rocher chocolates. 6. I am deathly scared of feathers attached to a living fowl (chicken, bird, duck, goose, and *shudder* turkey and ostrich). 7. I can’t stand any kind of suspense. I cover my eyes when watching scary/suspenseful movies and I like knowing how a book or a movie is going to end in advance (this absolutely kills Jun!). 8. I can fold both my eyelids upwards (to Jun’s and my siblings’ disgust). What the heck, it makes the kids laugh. 9. Driving brings out the worst in me. 10. I sometimes have trouble reconciling the girl I was then to who I am now. In a lot of ways, I still feel like a young girl, in an I-can’t believe-this-is-my-life kind of way. 12. I like my coffee strong with tons of sugar (Splenda, of course) and lots and lots (and lots!) of non-dairy creamer. 13. I am genuinely happy with my life. Um, mommy can you come here for a sec? This past weekend, I started two movies on DVD and got about halfway through but didn’t finish both of them. One was the movie “Click” which I started at around five thirty and had to stop because of dinner. Of course, after dinner meant baths for the kids, brush teeth, fix things for the work day and bedtime for the two rug rats. Then the hubby and I decided to watch “Underworld 2” which we decided to stop midway because we had to get up early the next day. Sometimes it seems my life is a constant state of interruptions. I get interrupted in the bathroom, reading, eating meals, getting ready (whether for bed, going out, etc. ), watching TV, movies, etc., etc., etc.. Everything I do must be done at a very fast pace. Being able to do things within a minimal amount of time has now become a habit. Things I can do in 5 minutes – eat meals and take a bath. I can finish getting dressed in 10-15 minutes and can do my own mani/pedi in 20-30 minutes. In the beginning when the kids were really young, it was a necessity, otherwise I wouldn’t even be able to go to the bathroom. Now, well, I guess I got used to operating in fast forward. And then Joshua and Faith got used to being attended to right away that they balk when I don’t give them my complete attention the minute they ask for it. So I hurry, hurry, hurry. Hurry in getting the kids ready for bed ‘cause it’s late, completely missing the times Joshua would sing and make funny faces while washing up. I fast track getting the kids to sleep and miss the usually hilarious whispered conversations with Josh in the dark about nothing in particular. The things I loved to do (read books, chat with my sisters) were put aside so I can give my children the complete attention they wanted and (I thought) deserved. Now I’m slowly regaining my sense of self. 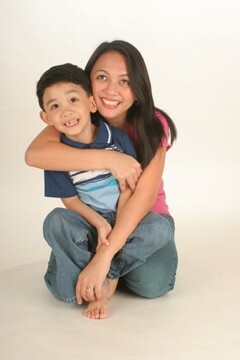 I realize I lost it for a while, being completely immersed in being a mother. I guess, as in everything, a balance must be kept. The kids are older and it won’t kill them to have to wait a few minutes before I can look at the huge poop they just plopped in the bathroom. Yeah, with experience comes the power to ascertain whether whatever it is can wait – or if it’s something you need to pay attention to right away say, like Josh putting a pillow over Faith’s face or catch the two of them hugging and kissing each other in a rare and heartwarming display of sibling love. I still haven’t decided whether to finish “Click” or not. Not a big fan of Adam Sandler who I think is the Hollywood version of Tito, Vic and Joey. I’m thinking maybe I’d rather watch Faith or Joshua go poop in the bathroom. It’s much more entertaining and the comic material is fresh. By the way, the post title is what Joshua says when he wants me to check out his poop. You didn't need to know that but too bad -- I felt like sharing.